Showcasing the very best up and coming talent in Medway and Swale. Dancers, singers, bands and much, much more coming together for one spectacular event! Medway Sunlight Rotary Club presents an evening not to be missed! Young Local Talent raising money for young local families. 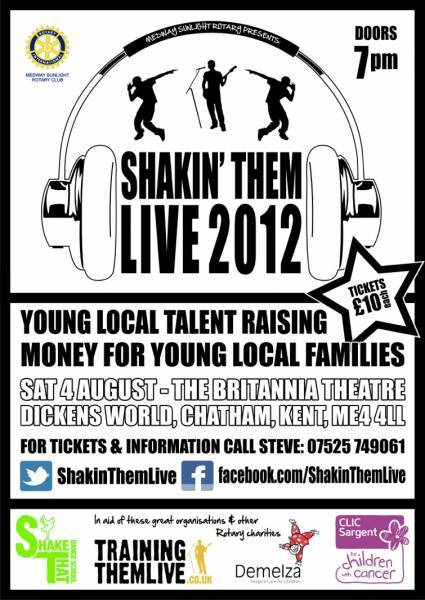 On Saturday 4th August 2012 get down to the Brittania Theatre - in Dickens World at Chatham Dockside - to experience an unforgettable evening of dance from Shake That Dance school and music from Training Them Live - two local organisations providing the opportunity for youngsters to develop their talents. But don't take our word for it - these guys have won numerous competitions and set the pace. All profits from the evening are going to provide a trip of a lifetime for Demelza Hospice families to EuroDisney, to help CLIC Sargent for children with Cancer and for other Rotary charities. Tickets and information can be obtained from Steve on 07525 749061, on Twitter ShakinThemLive ,on facebook.com/ShakinThemLive or from any Rotarian at Medway Sunlight Rotary Club. Watch the video of what it was about!